- Reference columns by using one-part names only. - Sort aggregates by SalesTerritoryID, and then by ProductID. - Order the results in descending order from SalesTerritoryID to ProductID. - The solution must use the existing SELECT clause and FROM clause. You need to create a query for a report. - NOT use object delimiters. Return the most recent orders first. - Use the first initial of the table as an alias. - Return the most recent order date for each customer. - Retrieve the last name of the person who placed the order. 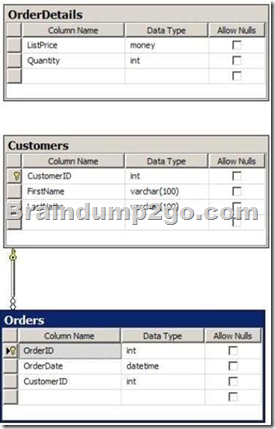 - Return the order date in a column named MostRecentOrderDate that appears as the last column in the report. - UnitPrice must be returned in descending order. 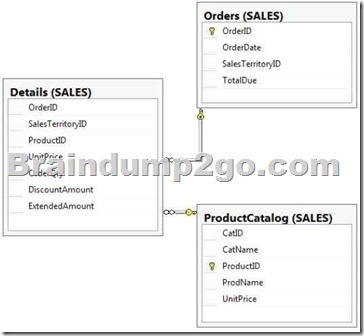 - The query must use two-part names to reference the table. 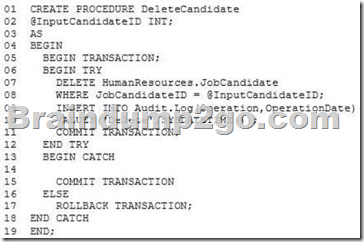 - The query must use the RANK function to calculate the results. 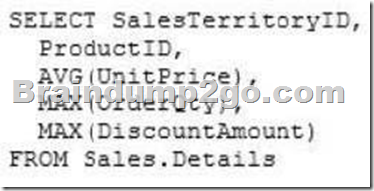 - The query must return the ranking of rows in a column named PriceRank. 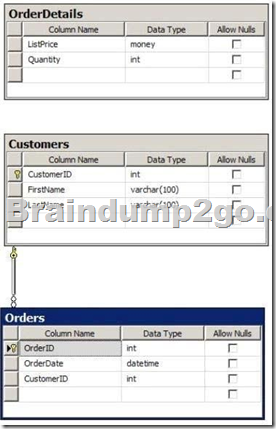 - The list must display the columns in the order that they are defined in the table. - PriceRank must appear last. - NOT use object delimiters. - Minimize sorting and counting. - Return only the last name of each customer in alphabetical order. - Return only the number of rows specified by the @Count parameter. - The solution must NOT use BEGIN and END statements. You need to append the "This is in a draft stage" string to the Summary column of the recent 10 entries based on the values in EntryDateTime. 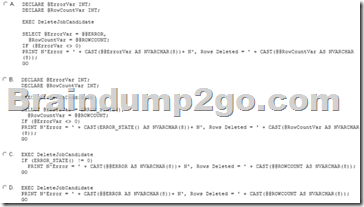 According to the append possibility of .Write method when offset is specified as NULL. You need to create a report that displays the profits made by each territory for each year and its preceding year. MORE Practice is the Most Important IF You want to PASS 70-461 Exam 100%!